F-Droid is a community-maintained software repository for Android, similar to the Google Play store. The main repository, hosted by the project, contains only free libre software apps. Applications can be browsed and installed from the F-Droid website or client app without the need to register for an account. "Anti-Features" such as advertising, user tracking, or dependence on nonfree software are flagged in app descriptions. The website also offers the source code of applications it hosts, as well as the software running the F-Droid server, allowing anyone to set up their own app repository. F-Droid was founded by Ciaran Gultnieks in 2010. The client was forked from Aptoide's source code. The project is now run by the English nonprofit F-Droid Limited. Replicant, a fully free software Android operating system, uses F-Droid as its default and recommended app store. The Guardian Project, a suite of free and secure Android applications, started running their own F-Droid repository in early 2012. In 2012, Free Software Foundation Europe featured F-Droid in their Free Your Android! campaign to raise awareness of the privacy and security risks of proprietary software. F-Droid was chosen as part of the GNU Project's GNU a Day initiative during their 30th anniversary to encourage more use of free software. To install the F-Droid client, the user has to allow installation from "Unknown sources" in Android settings and retrieve the APK (installable file) from the official site. Installation is not available through the Google Play store due to the non-compete clause of the Google Play Developer Distribution Agreement. The client was designed to be resilient against surveillance, censorship, and unreliable Internet connections. To promote anonymity, it supports HTTP proxies and repositories hosted on Tor hidden services. Client devices can function as impromptu "app stores", distributing downloaded apps to other devices over local Wi-Fi, Bluetooth, and Android Beam. The F-Droid client app will automatically offer updates for installed F-Droid apps. When the F-Droid Privileged Extension is installed, updates can also be conducted by the app itself in the background. The extension can be installed via rooting, or by flashing a zip file on the device. The Android operating system checks that updates are signed with the same key, preventing others from distributing updates that are signed by a different key. Originally, the Google Play store required applications to be signed by the developer of the application, while F-Droid only allowed its own signing keys. So apps previously installed from another source have to be reinstalled to receive updates. As of 2017, Google Play encourages developers to let Google Play manage the signing keys, offering a similar service to what F-Droid has offered since 2011, and F-Droid now lets developers use their own keys via the reproducible build process. In 2012, security researcher and developer Moxie Marlinspike criticised F-Droid for distributing out-of-date versions of TextSecure which contained a known bug that had been fixed in the official application. F-Droid removed the application from the repository at the request of Marlinspike. Marlinspike later criticised the project's handling of the issue, stating that they "mischaracterized the scope of [the] bug" and were "incredibly immature" in their post announcing the removal, after he received email from users who had been misled by F-Droid's announcement. ^ "F-Droid on F-Droid repository". F-Droid client code repository. F-Droid Limited. Retrieved 6 February 2019. ^ "Repository Maintenance". F-Droid. F-Droid. Retrieved 18 April 2018. ^ "Client 0.54 released". F-droid.org. 5 November 2013. Archived from the original on 26 April 2015. ^ Hildenbrand, Jerry (27 November 2012). "F-Droid is the FOSS application store for your Android phone". Android Central. ^ Nardi, Tom (27 August 2012). "F-Droid: The Android Market That Respects Your Rights". The Powerbase. Archived from the original on 3 December 2013. ^ "Commits by year and month of F-Droid data reported by gitstats". 2017. Retrieved 19 July 2017. ^ "F-Droid initial source code". F-Droid. 19 October 2010. Archived from the original on 10 December 2014. Retrieved 10 December 2014. ^ a b "F Droid About". Retrieved 28 January 2014. ^ "FDroid: a free software alternative to Google Market". Replicant Project. 26 November 2010. Retrieved 17 January 2015. ^ "Our New F-Droid App Repository". The Guardian Project. 15 March 2012. ^ Walker-Morgan, Dj (28 February 2012). "FSFE launches "Free Your Android!" campaign". H-online. Retrieved 27 July 2014. ^ "Liberate Your Device!". Free Software Foundation Europe. Retrieved 27 July 2014. ^ "GNU-a-Day". GNU Project, Free Software Foundation. Retrieved 23 July 2014. Day 9: Have an Android phone? 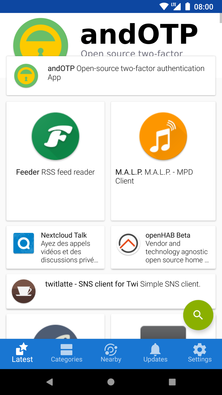 Install F-Droid, a repository with hundreds of free software apps. ^ "Copperhead, Guardian Project and F-Droid Partner to Build Open, Verifiably Secure Mobile Ecosystem". The Guardian Project. 28 March 2016. ^ Linder, Brad (8 September 2015). "CopperheadOS wants to bring better security to Android". Liliputing. ^ "Contribute". F-Droid. Retrieved 29 March 2015. ^ "Inclusion Policy". F-Droid. 4 April 2014. Retrieved 29 March 2015. ^ "Android Open Distribution". 31 October 2012. Retrieved 31 October 2012. ^ "Google Play Developer Distribution Agreement". 31 October 2012. Retrieved 31 October 2012. ^ "Client 0.76 Released". F-Droid. 14 October 2014. Retrieved 28 March 2015. ^ Brandom, Russell (10 June 2014). "Your survival guide for an internet blackout". The Verge. Retrieved 2 August 2014. ^ "F-Droid Privileged Extension". F-Droid. Retrieved 19 June 2018. ^ "org.fdroid.fdroid.privileged.ota_2070". F-Droid. Retrieved 19 June 2018. ^ Marlinspike, Moxie (12 February 2013). "moxie0 commented Feb 12, 2013" – via GitHub. ^ "Signing Your Applications". Android Developers. Google. ^ "Release Channels and Signing Keys". F-Droid. 12 August 2014. Retrieved 29 March 2015. ^ Glick, Kobi (6 September 2017). "Enroll for app signing in the Google Play Console & secure your app using Google's robust security infrastructure". Android Developers Blog. Google. ^ "Security Notice – TextSecure". F-Droid. 23 August 2012. ^ Marlinspike, Moxie (24 August 2012). "SMS Plain text leak via LogCat" – via GitHub. This page was last edited on 14 April 2019, at 15:18 (UTC).